Need a brainless diversion? 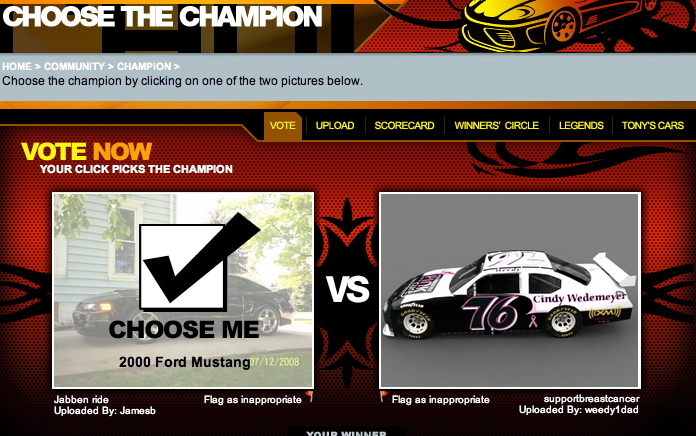 Visit Choose the Champion. Think fast: two cars pitted against each other. Who wins? Your click makes a winner. Questioning your value? Track your progress. Feeling aggressive? Upload your own car shot. Need a friend? There's a message board, too. The whole thing is one big fat promotion for Armor All, brought to you by the immortal folks at Clorox.